What’s the main problem with Islam? The mosque and minaret, or the Wahhabi-Salafist apprehension of Mohammed? Professor Sayeeda Warsi (of St Mary’s University, Twickenham) explains: “What I would like to see is the quintessential English mosque,” says the Baroness to the Telegraph‘s John Bingham. “It is not for me to say what that would look like,” she adds with academic humility, before retracting her diffidence with the observation that there is “no reason why” mosques might not be built to resemble English village churches. Which is a bit useful, because quite a few English churches have already been converted into mosques, though not too many village ones: the rural idyll of harvest, cricket, cowpats and warm beer isn’t the preferred lifestyle of most Muslims. But converted churches abound in British towns and cities – Brent, Peckham, Wembley, Brick Lane, Green Lane, Manchester, Oldham, Southend, Margate, Cardiff.. And don’t assume that it’s just an Anglican/Nonconformist problem: St Peter’s Roman Catholic Church in Stoke-on-Trent has also been converted into a mosque. With most of these churches, the spire has been converted into a minaret, or, where there was no existing spire to convert, a great minaret has been abutted to the main church building to somehow islamify it. Baroness Warsi isn’t a huge fan of this. It’s not for her to say what the “quintessential English” mosque should look like, but minus the minaret is, for her, seemingly a bit more English. Which is a bit odd, since minaret-less mosques exist all over the world (as they do without mihrab, minbar or dome). The Unites States has been moving away from the minaret for quite a few years, and Switzerland eve has a minaret ban. Even the Kaaba in Mecca is just a cube. A minaret-less mosque is no more quintessentially English than tolerance and respect are British values. Why does a mosque have to look as if it had been transported directly in from the Middle East? There is no specific directive in the Qur’an about minarets. The building simply has to face in the direction of Mecca. Just that. But over time we have come to stereotype the mosque. The traditional has become the conventional, and convention has become thoroughly identified with sanctity. Cupolas, domes and minarets are it. 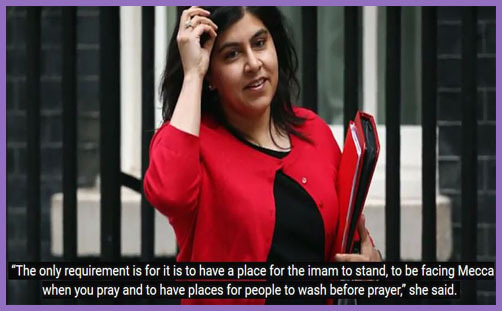 Professor Baroness Warsi agrees up to a point: “The only requirement is for it is to have a place for the imam to stand, to be facing Mecca when you pray and to have places for people to wash before prayer.” But surely the principal reason for wudhu in the mosque was to wash all that Arabian sand off your hands and dust off your feet before you prayed? Do we not now have showers and baths in our own homes, not to mention roads made of tarmac and cars that don’t reek of camel? The peer, who served as faith minister in the Coalition government, is setting up a new foundation in her name to promote religious tolerance, said she wanted to start a national debate about places of worship in the 21st century and is planning a design completion to come up with new plans for mosques. Ah, the ‘Warsi Faith Foundation for the Promotion of Religious Tolerance’? This debate (and design competition) isn’t so much a socio-theological inquiry as an exercise in branding and self-promotion. What is the principal reason for this new foundation, when we already have the Tony Blair Faith Foundation dedicated to the same theo-political pursuit? Why couldn’t she simply join that and help to forge a genuine cross-party mission? “I want to see an Islam which sits comfortably within Britain and a Britain that sits more at ease with Islam,” says the Baroness. Well, so do we all. But it doesn’t begin with external matters of architecture, dress or what you eat. That is the blind leading the blind. What did Jesus say to the Pharisees and teachers of the law when they criticised his disciples for not washing their hands before they ate? He talked of those who honour God with their lips while their hearts are far from Him. ‘But in vain they do worship me, teaching for doctrines the commandments of men’ (Mt 15:9). It isn’t what goes into someone’s mouth that defiles them, but what comes out of their mouth. It isn’t a minaret on a mosque that offends the English spiritual disposition, but the evil thoughts and vile sermons of too many imams in those mosques, not to mention the perpetual cosying up to the fons et origo of the Islamist ideology. Why didn’t Baroness Warsi say much against Saudi-Salafism when she was a Foreign Office Minister? Too busy obsessing about the evils of Israel and the virtues of Palestinian statehood? Forget the minarets: a “quintessential English” Islam urgently needs a robust Mohammedology for modernity (and the freedom to develop one without allegations of preaching ‘hate’, ‘Islamophobia’ or being summarily beheaded).